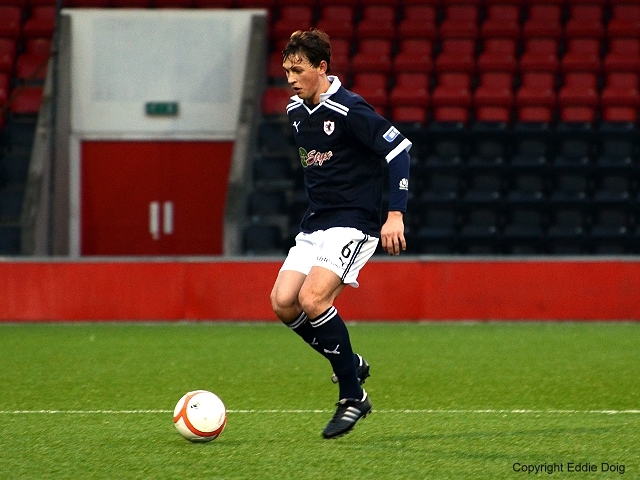 The Rovers lined up against Airdrie with enforced changes as Hill and Walker watched from an executive box. 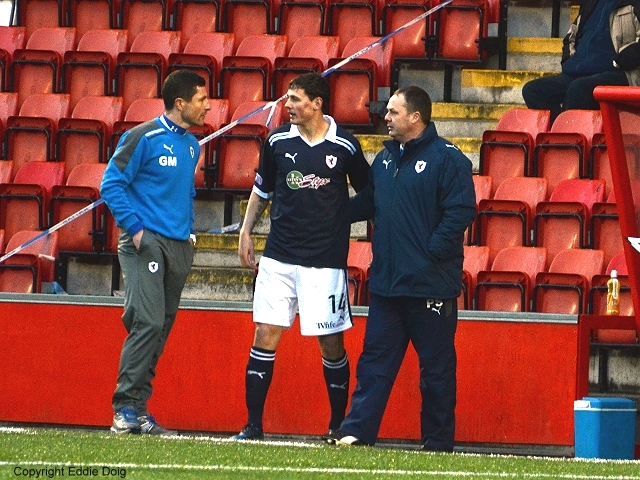 Dave McGurn joined them as the Rovers support sat outside in the cold. Spence dropped to the bench with Brian Graham returning to the starting eleven where he joined Stuart Anderson and Joe Hamill. 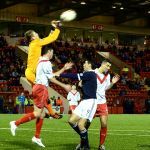 Despite having visited in the Cup only the other week two Airdrie starters have since left the club so their team was also different. The Rovers had the first foray forward but an early cross was cleared. 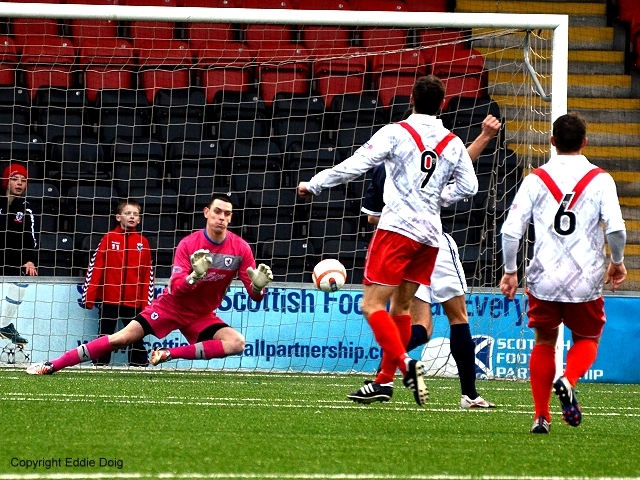 Airdrie won a corner having capitalised on a slack pass in midfield. Di Giacomo had a run and shot from the edge of the box but Laidlaw pushed the shot away well. David Smith persisted on the right but his cross was too close to the home keeper. The game settled down with play being relatively even but the home side having more opportunities. Di Giacomo looked keen and had another go low from 19 yards however, Laidlaw saved low. The Rovers fans were trying to encourage their team with some entertaining chants and a diverse musical repertoire from Soft Cell to Elvis via Adam Ant! The vocals took the minds of the fans off the poor fare on the park. Di Giacomo did well getting into the box despite Laurie Ellis and his low drive was well blocked away by Laidlaw at the far post. From a corner Bain’s vicious shot from outside the box was bravely headed over by Malone. In the 20th minute the ball went over the line when Laidlaw was heavily fouled and dropped the ball. 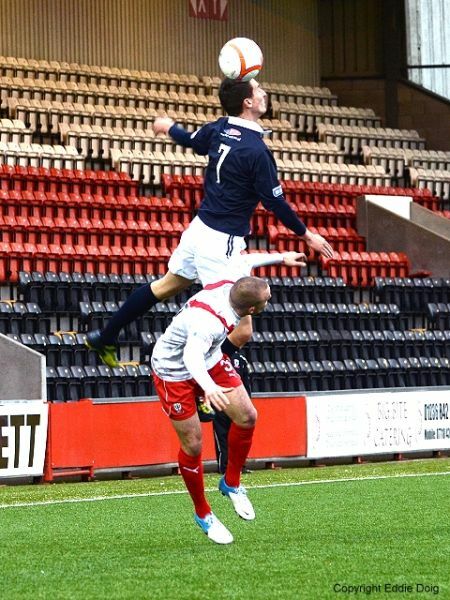 The referee rightly penalised an overly vigorous Airdrie man and the score sheet remained blank. 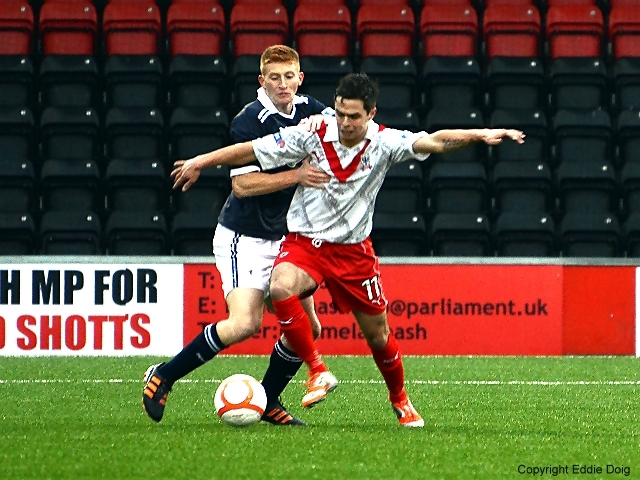 Smith had a long range effort as the Diamonds created a few more half chances. Eddie Malone was heavily fouled by ex-Rover John Boyle but recovered to move into the middle of the back four as Ellis limped off in the 35th. Donaldson went on filling the left back position. In the 38th minute there was concern for visiting fans but some ‘pinball’ in the box eventually saw the ball cleared. Smith had an effort on target before the half but it didn’t test the home custodian. The second half didn’t see much improvement. 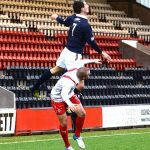 In the 49th Brian Graham’s downward header was volleyed first time by Grant Anderson but it was high and not too handsome. In the 55th minute Eddie Malone curled in a free kick towards the top corner but there wasn’t enough pace on it to beat Adam in the home goal. 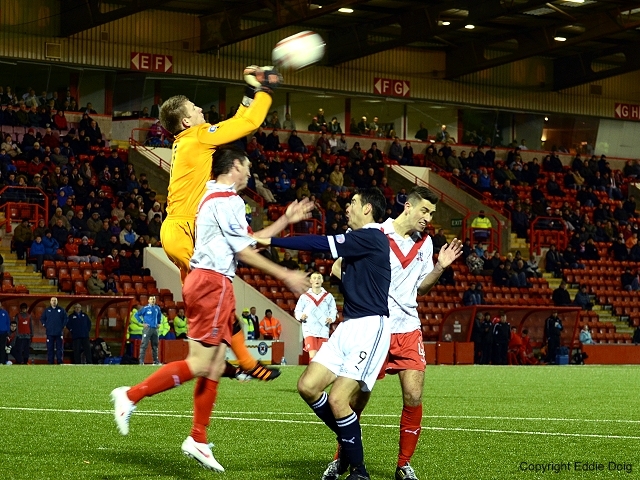 Moments later Thomson and Clarke combined with the former’s shot being blocked away by the keeper. Adam did not look so good when he dashed out only to see the ball go over him and Graham’s header across went behind him but was mopped up by a defender. 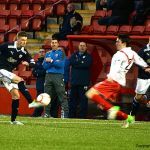 On the hour Airdrie had perhaps their best chance, Jack Boyle ended up behind the Raith defence and shot low into the side netting only to be berated by John Boyle who was in the centre of goal and could have netted easily if he’d been played in. 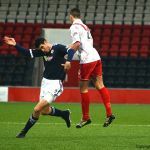 Jack, a minute later, tried to redeem himself and fouled Stuart Anderson in the middle of the park earning a yellow card. Moments later Jack was neither nibble nor quick when he scythed down Grant Anderson who was dashing down the near wing. It was the quickest double yellow then red most fans had seen in a long time. Despite the one man advantage the Rovers didn’t manage to take full control and Airdrie showed some threat on the break after substitutions. 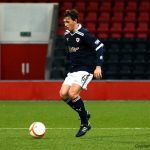 Grieg Spence replaced Clarke and showed some urgency but it wasn’t until the 85th minute that the deadlock was nearly broken. Graham teed up Spence who getting into the box drove a low shot at goal. Adam took the pace off the ball and was no doubt pleased to claim it at the second attempt. 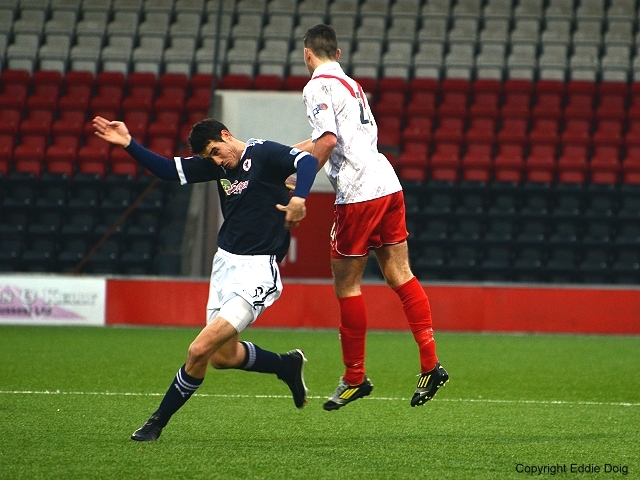 As time ran out Grant Anderson couldn’t get a shot off after Smith’s cross was missed by the keeper. At the other end Laidlaw looked calm dealing with another break by Bain. The last action saw Smith shoot wide. 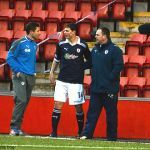 Raith team news sees Hamill and S Anderson come into midfield with Mensing moving to the back 4. 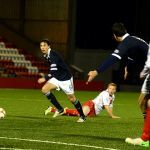 Brian Graham also returns for Spence. Greig drops to the bench and I imagine Mensing will captain in Allan Walker's absence like he did for the second half last week. Good play by G Anderson, his cross is sclaffed clear by the home defence. John Boyle run and shot tipped wide by Laidlaw. Smith picks up a poor throw out but he crosses too near the keeper. Di Giacomo shoots straight at Laidlaw. Smith run and cross but Graham can't do anything with it. 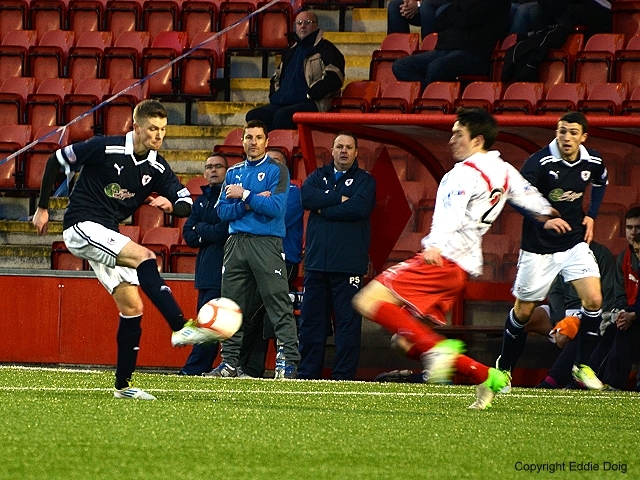 Ball over the top to Di Giacomo and Laidlaw steers his shot wide. Watt free kick punched clear by Laidlaw. Smith drags a shot wide from 18 yards. Di Giacomo runs forward but shoots into the stand. 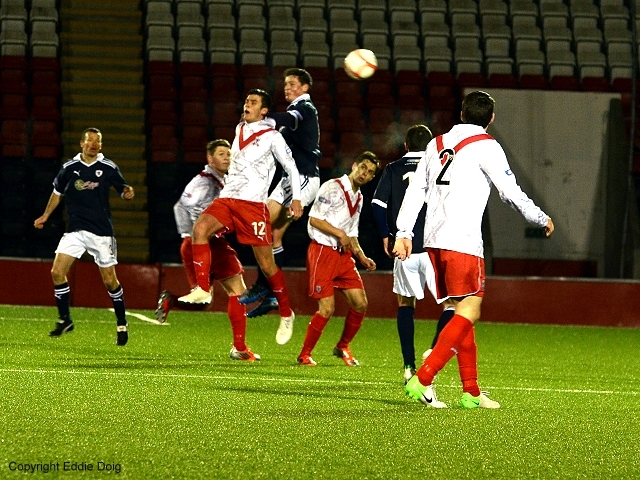 Laidlaw cuts out a dangerous cross before it hits an Airdrie head. Donaldson on for Laurie Ellis, Malone goes to CB. Looks like a hamstring injury for Ellis. Graham heads straight at the keeper. Smith shoots weakly at the keeper. Blockley shoots tamely at Laidlaw. G Anderson hits it over the bar from a Graham knockdown. Intelligent play from Clarke to go past a defender but his resulting chip is easily saved. 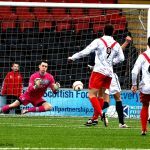 Thomson through on goal but Adam saves then Graham's header beats the keeper but is cleared near the line. Thomson crosses for Graham who goes to ground under a challenge but nothing given. And is then booked moments later. Second yellow for Boyle and his game is over. 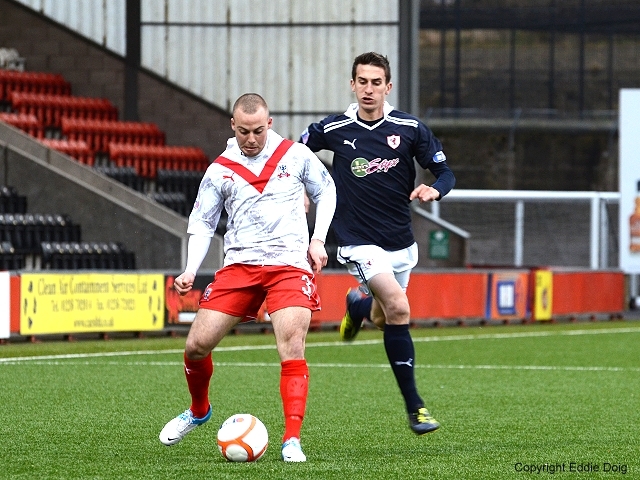 Two fouls in quick succession leaves Airdrie with 10 men for the remainder of the game. Overhead kick goes straight into Laidlaw's arms. Neat play by S Anderson but Thomson shoots wide. Graham hooks a shot over. Smith corner sent wide by Graham. Throw to Graham who holds it up for Spence whose shot is saved. Bain shoots but Laidlaw saves. Ball into Smith at the edge of the box but he shoots well over.